This 1100ml glass teapot is good for loose tea and other infusions. Heat resistant. Ideal for Catering, cafes, restaurants and coffee making at home. Prepare delicious tea and share it with your relatives and friends. Glass teapot. Colour : Clear. Transparent for easy viewing. Perfect for loose tea, flowers and other infusions. Ideal for hand wash. Heat resistant. Tempered glass. Easy to clean parts. STAINLESS STEEL & GLASS TEAPOT. These are great for straining leaf teas and herbs with the integral stainless strainer. Thermal shock resistant glass. Important notes. Apollo Glass Teapot, 1.1L. This stylish glass teapot is good for loose tea, flowers and other infusions. Stainless steel strainer for loose tea, flowers, and other infusions. Glass teapot with stainless steel strainer tea coffee infuser kitchen with 1100 ml capacity. Easy clean easy assembly parts thermal shock resistant glass comfortable grip wash thoroughly before first use. 1100ml GLASS TEAPOT WITH STRAINER. 1100ml capacity. These are great for straining leaf teas and herbs with the integral stainless strainer. Thermal shock resistant glass. 1100ml GLASS INFUSION INFUSER TEAPOT HERB TEA COFFEE MAKING POT LEAF STRAINER. 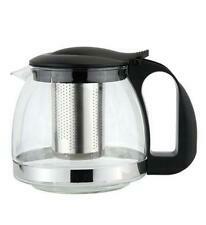 Glass teapot with stainless steel strainer tea coffee infuser kitchen with 1100 ml capacity. Easy clean easy assembly parts thermal shock resistant glass comfortable grip wash thoroughly before first use. APOLLO 1100ML GLASS TEA POT WITH STRAINER. Ideal for straining leaf & herbs tea with the integral stainless strainer. Thermal shock resistant glass. The teapot pours well even at low flow rates,do not drip from the spout; Clear glass make the teapot contemporary and stylish,you can see the strength of the tea brewing,enjoy seeing the tea colour diffusing out from the centre as you add the hot water. 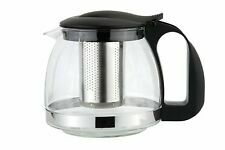 TOYO HOFU High Borosilicate Glass Tea Pot Heat Resistant Large Clear Teapot with #304 Stainless Steel Infuser & Lid,1200ml. Toyo Hufu teapot make of High Borosilicate Glass,80% content of silicon, 10% higher than ordinary borosilicate glass,has low softening point and low thermal expansion, so it shows high-resistance and excellent anti-fracture ability. Apollo Glass Teapot, 1.1L. this stylish glass teapot is good for loose tea, flowers and other infusions. Stainless steel strainer for loose tea, flowers and other infusions. We'll be glad to help. Need Help?.